Jews take part in 'Sivuv Shearim' - the ancient custom of circling the walls of the Temple Mount on Rosh Chodesh, the start of the new month. 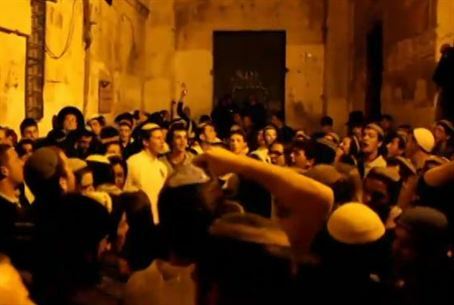 Thousands of people took part Sunday evening in "The Circling of the Gates" - Sivuv Shearim in Hebrew - a renewal of an ancient custom that expresses, in our age, a yearning for the Holy Temple. Sivuv Shearim involves making pilgrimage to Jerusalem, walking around the Temple Mount and stopping at each of its gates. The event takes place every Hebrew month on Erev Rosh Hodesh, the eve of the first day of the month. The route followed by the participants passes through the Muslim quarter of the Old City. The participants stop at every gate and recite a section of the Tenth Psalm. The event usually draws about 3,000 participants. Its organizers dream of the day in which 20,000 people take part, placing the Temple Mount on the public agenda for the entire Jewish nation.